← A couple of Christmas Quickies! We all agreed there were leukoerythroblastic changes with tear drop cells and basophilic stippling. These changes might be seen in myelofibrosis or metastatic cancer (although basophilic stippling would be unusual). They might also fit with Beta thalassaemia, although the tear drop cells wouldn’t fit and the red cell changes aren’t quite in keeping with thalassaemia. However what you weren’t told is that the patient is only three months old. On further enquiry we established she was hypercalcaemic and appeared to be blind (poor tracking of visual stimuli). She was also noted to have a distended abdomen and there were concerns about poor feeding and ‘snuffly’ breathing. which the radiologists tell us show classic ‘bone within bone’ changes. 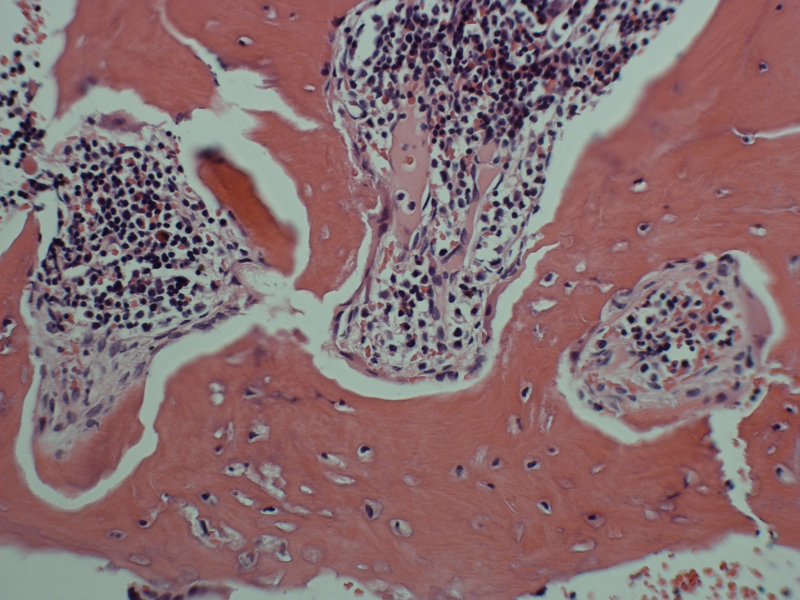 This shows dramatic thickening of the trabeculae, leading to occlusion of the marrow cavity – haemopoiesis is literally squeezed out of the bones. Oteopetrosis is also known as Marble Bone Disease and Albers-Schonberg Disease. They are in fact a heterogenous group of conditions characterised by increased bone density due to an abnormality of osteoclast differentiation/function. An adult autosomal dominant form exists which is mild but the infantile ‘malignant’ form, which is autosomal recessive, is fatal in first 2 years of life. Loss of medullary cavity leading to pancytopenia and extramedullary haemopoiesis. The mechanism for the development of osteopetrosis is an osteoclast differentiation defect. Ten genes have been identified to date, accounting for 70% of cases. The management of osteopetrosis is allogeneic bone marrow transplantation for severe infantile forms. However this will not reverse compressive optic neuropathy or linear bone growth. HSCT is not appropriate for primary neurodegenerative form as this will progress regardless of transplantation. The best outcomes are seen if transplantation is performed at <3/12 old. Complications of transplantation include – graft rejection, VOD, pulmonary hypertension, hypercalcaemic crises and delayed engraftment. The stats show good outcomes with matched sib transplants having a 73% 5 year survival. 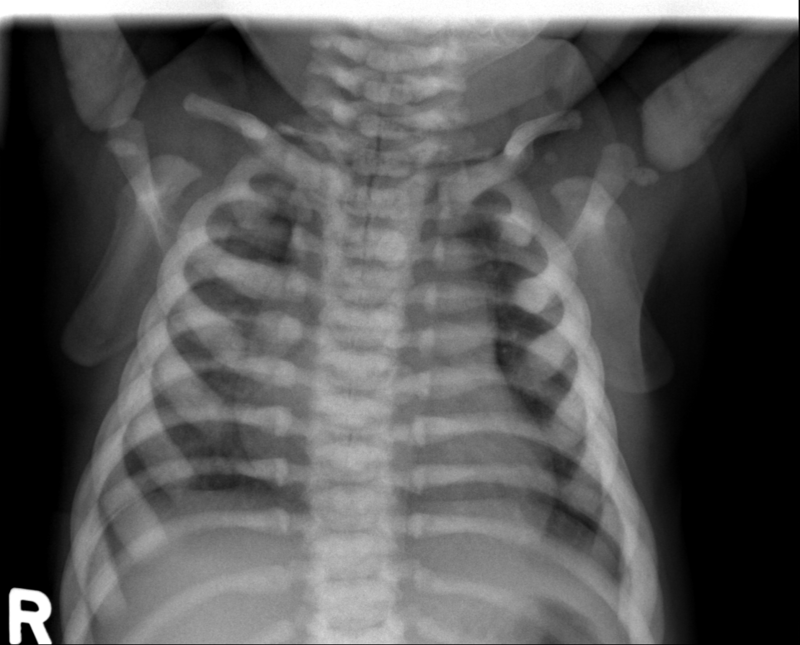 This entry was posted in Laboratory morphology, Paediatric haematology, Related to other specialities and tagged osteopetrosis. Bookmark the permalink.